Finding mobile apps that gel into Salesforce are not new, but nothing like creating one for you. The process of mobile apps development has just got simpler with CirroLogix.. This is all made possible for mobile apps that integrate with Salesforce. It abstracts away the complexities of communicating remotely with Salesforce, making remotely querying an org’s Salesforce database effortless. 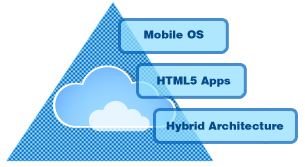 A hybrid architecture, where a native app is created that pulls its interface and views from HTML5 pages built in Visualforce and Apex. CirroLogix enables businesses to take advantage of mobile apps developer to improve and streamline the Salesforce interface for their employees for each job role they have.